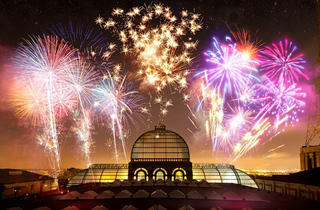 The Alexandra Palace Fireworks Festival is easily one of the biggest, baddest displays in town. In fact, it's so lofty, this year it's happening TWICE. 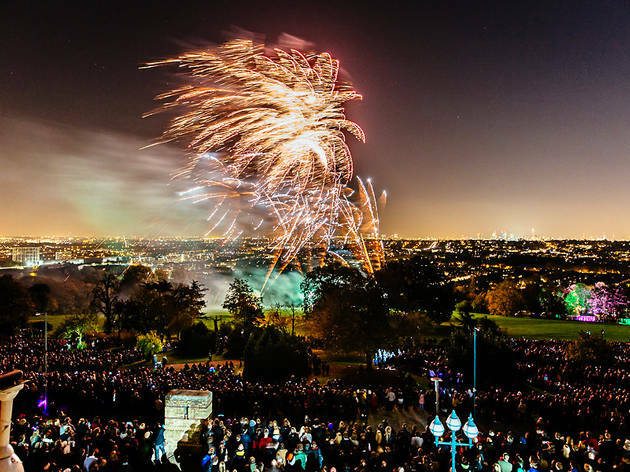 See impressive fireworks exploding with a glittering panoramic view of London as its backdrop while munching on street food and drinking craft beer. There is a family specific area, too. The show is fab though!! How incredibly disappointing this was. £11 per ticket (including a booking fee) for barely 20 minutes of average fireworks - not that I could see many of them what with the lazer light show going on. The park was packed and, what with the fun fair and food stall who no doubt will also have paid for the privilege of being there, I imagine they made a fortune out of this one night. My advice for people considering going next year - don't bother! I certainly won't. Very disappointed with the view from the family area - we actually felt that we'd been conned! The family area is down the hill below the tree line. 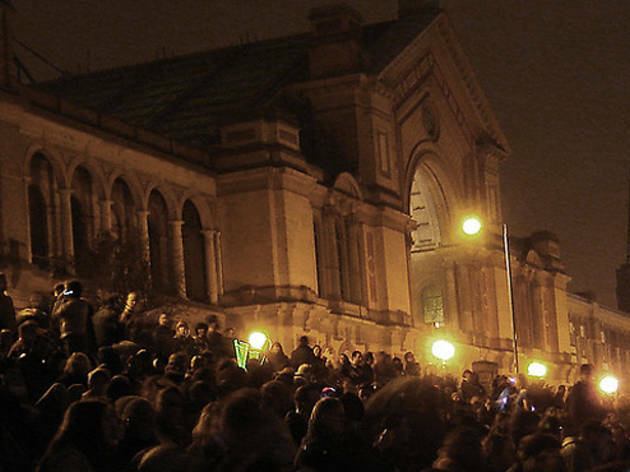 We couldn't see the laser light show, which projected onto the Palace, and you have to look up the hill to see fireworks - so you don't get to see them with the amazing city skyline as a backdrop - one of the primary reasons for going to Ally Pally. Also being down hill from the firework display meant we suffered from soot falling into your eyes! The organisers really should state that you cannot see the city skyline or the laser light show from the family area. The fireworks themselves are an impressive 20 minute show, and the parade was fun but without the laser show and the view of the city, its rather a let down. Massive 40 minutes for any food, thankfully we ate before going. Getting there and back on the train was very easy and very well organised. All in all through, we'll chose our local show again next year. Not being a native, I'm still learning the reasons behind watching fireworks to celebrate a guy who wanted to blow up parliament and failed. 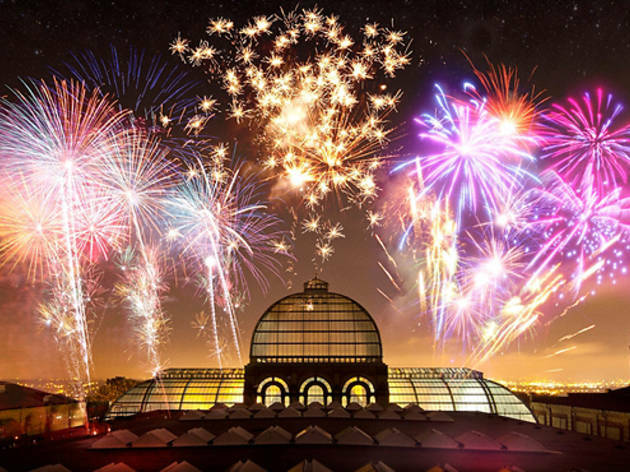 Nonetheless I do love to celebrate life winning, and where better to do this at Alexandra palace to watch a magical firework display. The display was one of beauty and articulate design. My personal favourite was Adele's Hello and the crackers synchronisation. But fireworks are not the only celebration. We felt like kids again by going on rides, eating a tub of mac and cheese, and watching day of the dead parade. Was a truly spectacular night. Just a tip though, don't try and leave straight after the display, crowds really are shocking, this also is true for food, unless you’re still there as it’s closing, then it’s food for all! Really fantastic evening - the fireworks were really impressive and made even more memorable due to the stunning views over London where you can also see the smaller displays! 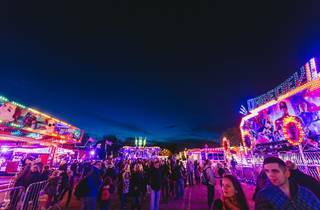 I would also recommend the german beer festival as it gives you a base and somewhere to keep warm plus good access to food stalls. 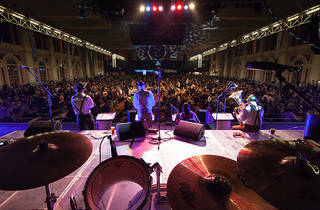 Great bands as well which made for a lovely atmosphere for a big group of friends. Will be going back! 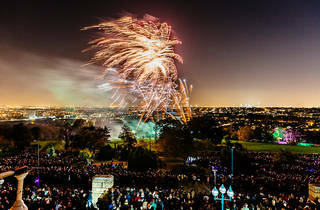 The fireworks display itself was AMAZING during most of it as you can see from my pic, However I much preferred the display at Brockwell Park the year before. At Brockwell Park the music was perfectly timed with the displays, and it felt a bit more playful! 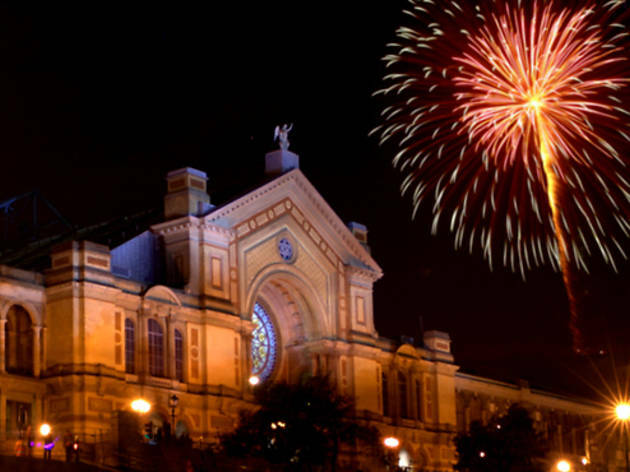 I felt with the Ally Pally display I got a bit bored at some points. The finale was incredibly underwhelming, so much so we thought "Is the end of the first part? Is there another part?" The crowd direction was average with not nearly enough stewards in some locations, some more signs would have helped. A lot of the food courts had run out of items quicker than expected, and queues seemed to just melt into each other. 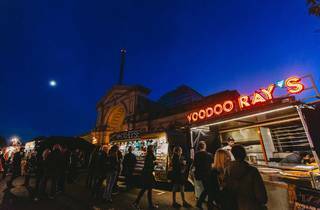 Before I got there I really fancied some mulled wine and hot food, but the queues were a massive turn off and this is coming from a regular music festival goer! 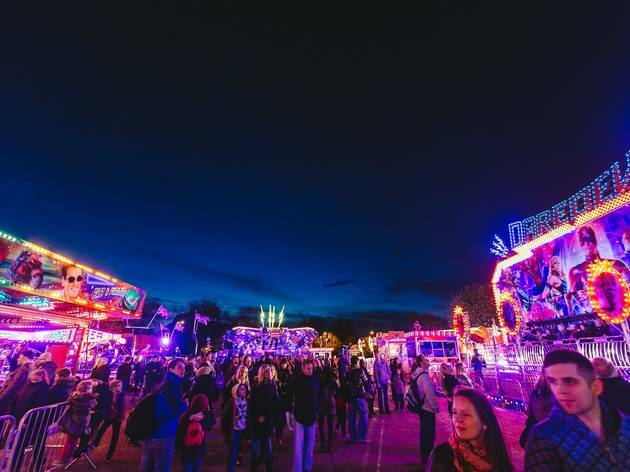 I will praise this event in some ways though, because of all the fireworks events I have been to, there is lots more to enjoy from the beer festival to the ice rink and much more. You also can't beat the London skyline view which felt romantic with views of other firework displays crackling in the distance. 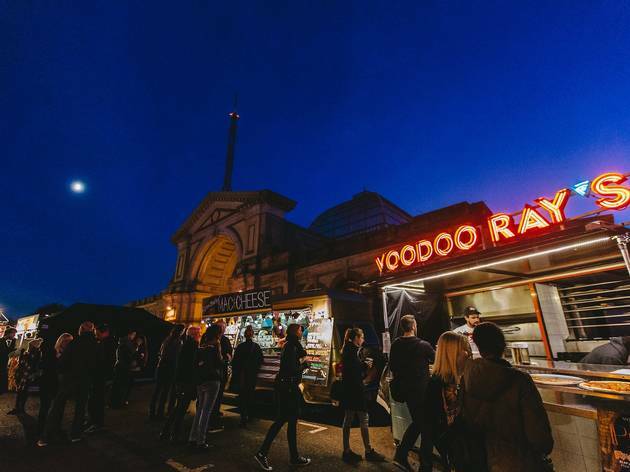 If you are looking to spend a whole afternoon and evening somewhere then sure come to Ally Pally! 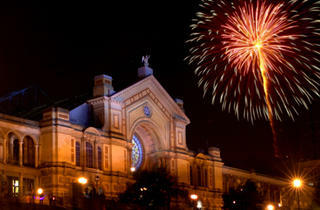 But if you fancy just an evening visit somewhere to see some pretty fireworks, Ally Pally wasn't for me. The firework display was the best I have ever seen. They were absolutely amazing although there needed to be more signage to show where to view them. It was so busy and a lot of rushing around prior to the display as people didn't know if they were in the right place. By 6.45 the bonfire looked as though it was about to go out! I've seen bigger fires in people's back gardens. Lighting is definitely an issue. Everything is so spread out over different levels with a lot of steep pathways but none are lit. I'm surprised with modern day health and safety that this would pass. More signs are definitely needed. The funfair is overpriced with it costing £20 for 4 people to go out the Waltzers which we timed to be less than a 2 minute ride. The day of the dead parade was an unexpected highlight. We had no idea what it was but thoroughly enjoyed it. If it wasn't for how amazing the fireworks were (accompanied by the parade) then I definitely wouldn't return. I'd advise to eat elsewhere and drink before/after you go. Dodge the funfair, don't bother with the bonfire. Turn up just in time for the parade, as soon as it finishes head up to get a good spot for the fireworks and leave promptly after! 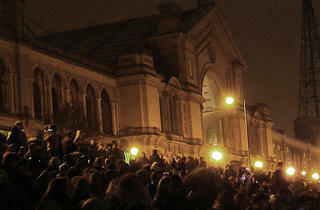 Went to the ally pally fireworks show and German bierfest last night and had the best time. WOW is all I can say about the fireworks show and the festival was lots of fun, great drink and food options. Must be the best fireworks show in London, can't imagine anything else comparing. Will deffo be returning next year! One of the best places to be for the fireworks' night. I really enjoyed being here. The fireworks last for about half an hour and you can easily compare them with the ones on New Years eve in London. 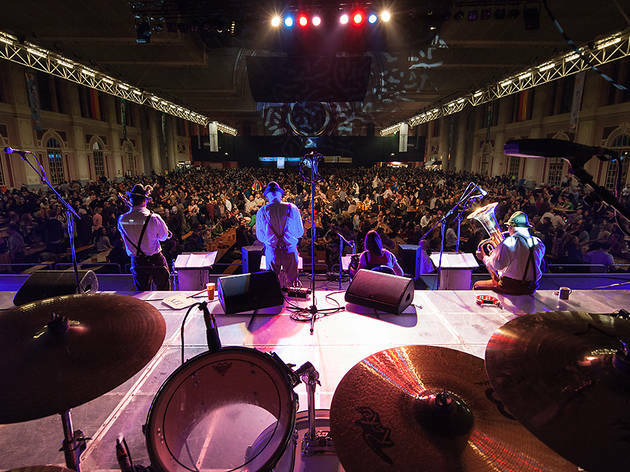 The music was also nice but the extra tickets for the beer festival don't worth it. If you book early, the entrance fee is just 6 £! Fireworks and Lasers were great, we watch with our kids from the top of the hill near the road in front of the Palace as the Family area was rammed. The fire parade could have been better and the bonfire was pretty much out when we got to the family viewing area. The queues for food down there were mental, so I think the tip is to just stay around the top part! We travelled from up North and will probably come again in the future.